This blog post discusses unique options for repairing concrete that save you time and money. This article is a review of the products used to refresh or resurface old concrete as an alternative to tear up and replacing concrete surfaces such as concrete sidewalks and concrete patios. The goal was to avoid the mess and costs of tearing up and replacing the concrete in these areas. The concrete in these two areas are 20+ years old. These criteria make this product an excellent candidate for use in a remodeling project. This is definitely a project to be done by the professionals. 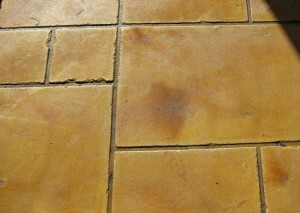 The key is to get this done as quickly as possible to the sealer stage to prevent any issues. A professional will have the experience and know how to finish this project in a high quality manner. If you can’t dedicate 20+ hours to this project (not recommended to leave it sitting halfway done across several days let alone weekend to weekend without touching it), then hire a professional. It will be well worth the cost. Brush Masters has the personnel properly trained to take on this project for you. Please call us at (763) 478-3232 to schedule a time for someone to come out and look at your concrete resurfacing project. Sherwin Williams provided the products for this blog piece.